Painless and fast removal even of very thick deposits of dental plaque, cleaning between teeth gaps even if the teeth are crowded. Air Flow cleaning makes the teeth surface smooth and polished, the teeth become visually whiter by a shade or half a shade; the increase of time period before the recall removal of dental plaque and tartar. It is important to understand that technically this method is not the same as whitening: the teeth become whiter due to the removal of dental plaque. The use of Air Flow is an integral part of professional hygiene for those who are wearing braces, implants or have a propensity to the formation of a thick pigmented plaque and occurrence of periodontal diseases. Particular attention is paid to the hygiene of the patient's oral cavity and complications of periodontal tissues (gingivitis, pаrodontitis, parodontosis). Work experience - more than 5 years. 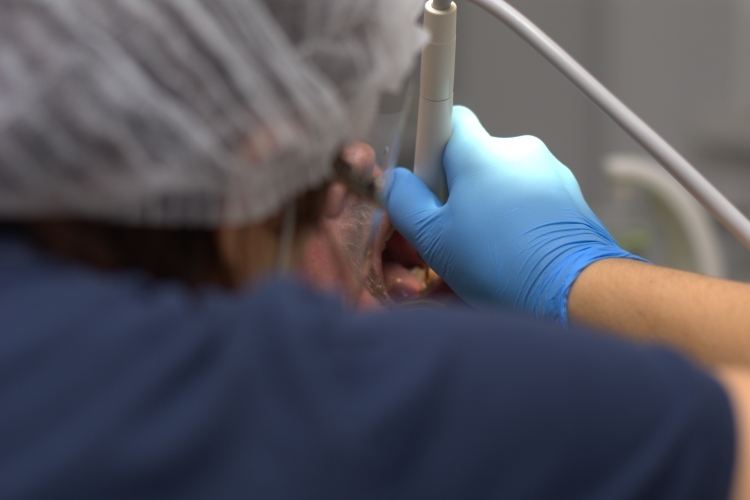 Before the start of the treatment, a specialist from the iStomatolog Center will determine the presence, quantity, location of the plaque as well as the solid pigmented and soft dental plaque. the final polishing of the tooth surface using pastes with different degree of abrasiveness. The procedure results in the whitening of teeth by a shade or half a shade, a significant improvement of the health of mucous tunic of the mouth, reduction of bleeding in the gums (in some cases, a complete cessation), and disappearance of halitosis. At the end of the procedure, the patient will receive recommendations regarding products for individual dental and oral care at home (toothpastes, gels). If so required, the doctor may appoint an extra checkup and hygiene control which will be carried out 10 to 14 days after the treatment. You will receive the information regarding the total cost of professional teeth cleaning during the checkup and free consultation at our iStomatolog Dental Center. Our dentists will determine the need for a certain method of professional cleaning, depending on the type (tartar, tight pigmented plaque, soft plaque) and the amount of dental plaque. Moreover, our specialists will select a full range of products for individual dental and oral care. Healthy teeth are not a myth, they are real!